Animism refers to the belief in the existence of spirit or souls in everywhere around and is still practiced in Laos. 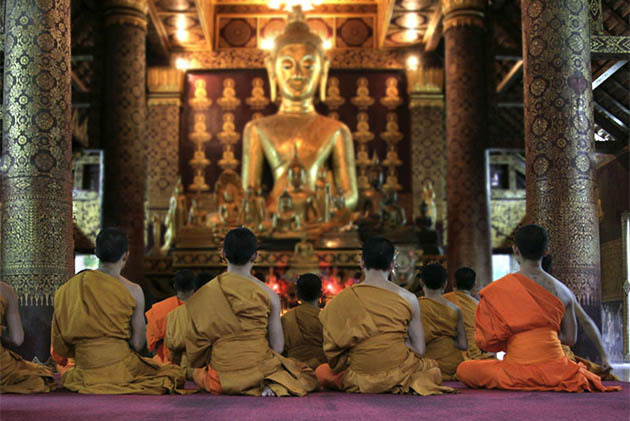 Why does Animist belief in Laos matter when we have already known that Buddhism is the most popular religion in Laos? If we trace back in the history, it is surprising to realize that at first, Laotian do not believe in Buddhism, but instead, they had Animist Belief. 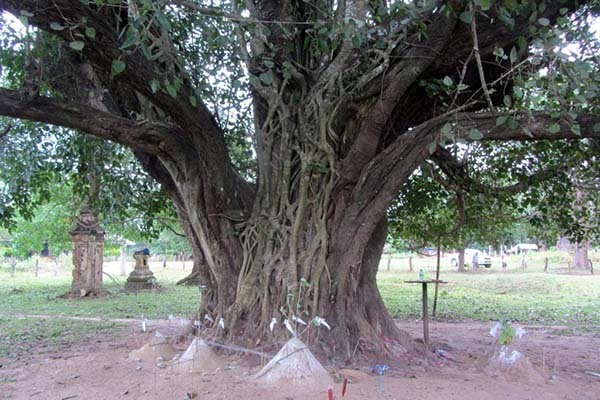 Nowadays, most ethnic groups in Laos are still following Animist Belief, and Animism is also spread among all Laotian classes together with Buddhism belief. The core idea is all about the “Phi”(spirits). In Laotian’s perspective, they believe everything happens (the nature of everything, reason for all illness and diseases) because of the presence of Phi in everywhere around us. “Phi” is divided into many kinds and types which explain for different circumstances. The first kind of “phi” related to the health. People believe that everyone is originated from 4 basic elements in the universe: earth, heaven, fire and water; and protected by thirty-two spirits (khwan). The explanation for a sick person is that one or more spirit has left his/her body. Therefore, he/she are no longer be protected by that spirit and become weaker which leads to illness. In order to eliminate the sickness inside their bodies, locals will carry out Baci ritual, a special religious practice. Another “phi” created when a person died of unexpected accident or violence or birth’s abandon. 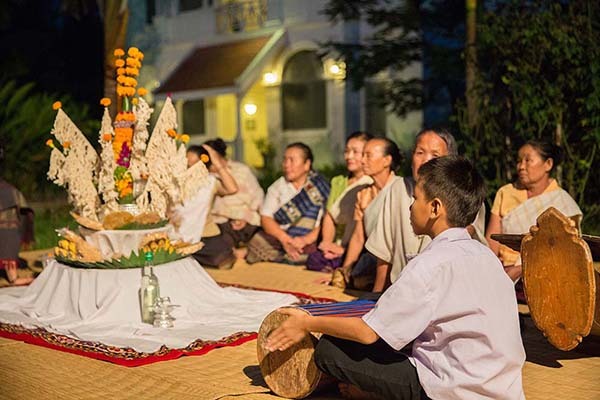 Lao loum believes that their spirits won’t be reincarnated, in contrast, become “phi phetu” (evil spirit) haunting and bringing bad luck to people. In order to reduce their negative influences, occasionally, locals will do some offerings pursuing needs as a normal spirit. It can be foods, flowers, etc. that show locals’ sincere. Animist believes that every human soul consists of 32 Kwan. These living forces harmonize and balance the body. Each Kwan watches and defends a specific body of the body. If one of these spirits occurs, the person will be sick. Therefore, the baci ceremony helps to regain the kun and restore the spiritual balance. Most of Lao Theung and Lao Sung ethnic group is animist and they also have the practice of ancestor’s worshiping. For each ethnic group, each of them has different practices and beliefs. For instance, Khmu regards spirit as “hrooy” and their idea of spirit also the same with “phi” of Lao Loum. Moreover, they think that the protection from the wild spirit is important, that’s why in their village, and there is always a spiritual house for the malevolent spirit. As long as the wild spirit has its own home, it no longer can harm other people in the village. In term of Lamet, the belief is similar, instead of a spiritual house, they think of a spiritual practitioner (xemia) who has the responsibilities of conducting all the sacrifices to the village spirit. When the practitioner died, there must be another one replacing him and usually one of his sons elected by married men in the village. If the practitioner does not have a son, they will choose one of his brother’s sons. Not only the wild spirit but also ancestor’s spirit matters for Lamet. They have a strong belief that the wealth of the family depends on their ancestor. Every action or decision must be notified to their ancestor since they are always following the family. There are many things the family has to avoid to do like the presence of ancestor in the family is real. 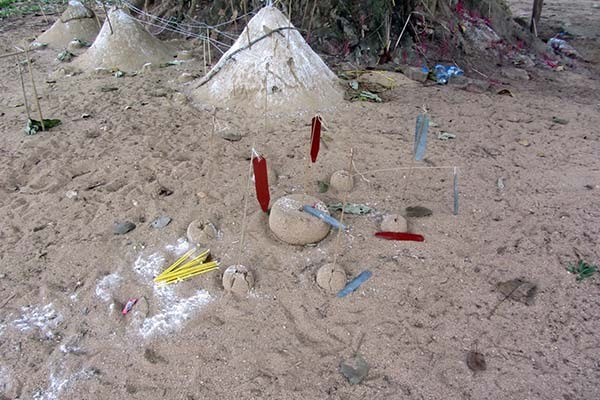 According to the animist tradition of the Laotians, the shamans may be a man or woman who has a special connection with the spirit world and can lead to sacrifice and ritual as a means of linking two worlds. If a soul is lost in the spirit world, a shaman can go to heaven and bring it back. The shaman sits on a wooden bench with a veil and began to chant and shake, finally mimicking a ladder to heaven to retrieve the lost soul. 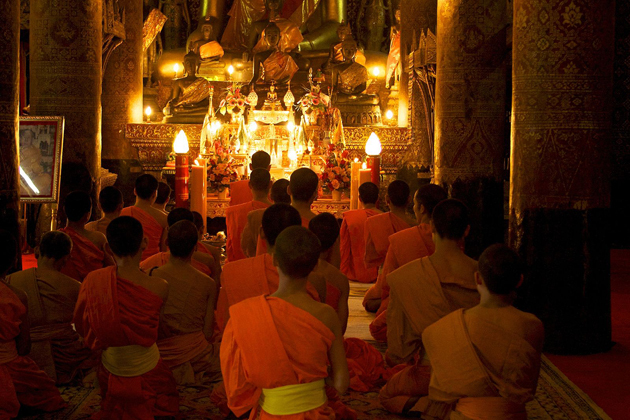 It is not uncommon for the Buddhist and animist traditions to blend. This is not a problem on any side because monks have been known to perform baci rituals and sometimes called upon to the evil spirits from home. You will almost always see a house containing souls erected on the grounds of Buddhist. This harmonious combination of tradition demonstrates the relaxed attitude of the Lao people. Lao people are known to be superstitious, always looking for good days to hold ceremonies and they believe that if you cut your hair on Wednesday or your birthday, it means you are killing yourself. If your right eye is blinking, it’s a good sign, but if your left eye is blinking, be careful! Cover your rice basket carefully when it’s done, otherwise, you will never be able to find your partner and remember that the night whistle is at risk for you because it attracts ghosts. Some animist traditions are considered quite odd. The practice of burying the dead underneath their house was not recommended for the purpose of limiting the spread of the disease. The Laos government also encountered a painful problem of other animist traditions that killed the newborn because the child had birth defects. Baci is a very important ritual ceremony which frequently carried out in daily life in Laos in every occasion: Wedding, Welcoming guest, House Warming, Laos New Year, etc. the aim of this ceremony is diverse. It can be bringing the good luck for the newlywed couple, bringing good luck for the guest or ensuring the new house would bring wealth to the owner or just some traditional custom must be done in major events in Laos. Baci or “Sou khuan” is “spirit enhancing or spirit calling”, which means exactly what it was. The ceremony involves the person in white strings around his/her body and the prayers doing some praying consistent with the aim of the ceremony. For instance, Laotian will carry out Baci ceremony for a newborn baby and his/her mother in order to increase the spirit of the mother which has been less during the childbearing. It also can be held for curing illness. People will call back all the spirit has gone away to maintain their strength. Even if they have passed away, the baci ceremony is once again carried out to balance the harmonization of the whole family. The essential thing which can be lack of in Baci ceremony is Pha Khuan, the handmade marigold pyramid made by elder women in the village. Pha Khuan will be put on a white fabric in the center of the room and prayer will gather around it. The host of the ceremony, the most experience one will sit at the nearest place to Pha Khuan and other sit behind him/her. 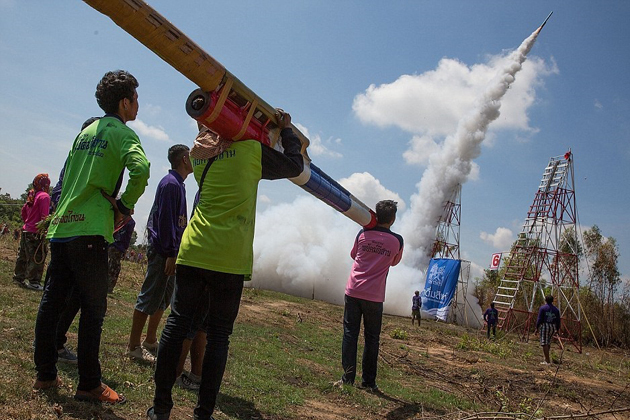 Boun Bang Fai, also known as the rocket festival, takes place in summer in the sixth lunar month. On these days, homemade rockets will be shown and shot in the sky with the expectation that the gods will bring rain. The rewards will be given to the highest and most beautiful and entertaining rockets. There are also “prizes” for losers. The prize may be to dip in the mud or drink rice wine. When a Laotian dies, the body is kept in the family’s house for three days before being cremated and buried in a small stupa. Family members bring food and visit, play cards, drink beer and share stories with their family. A vigil must hold the candles, and someone looks after the coffin for the entire time he or she is awake. One thing to note, young children, do not attend funerals because they are susceptible to souls from the other world that can hang around the house. Spiritual House is something that is popular everywhere in Laos, especially in the village. Each village needs at least one spiritual house to protect the entire villager from the evil spirit. The offerings are to claim down the negative spirit and get the peace for everyone instead. Buddhism is blending with Animism at some point. In some temples (wats) in Laos, you will notice a small spiritual hut with the aim to worship the good spirit even though the presence of Buddhism is strong here. 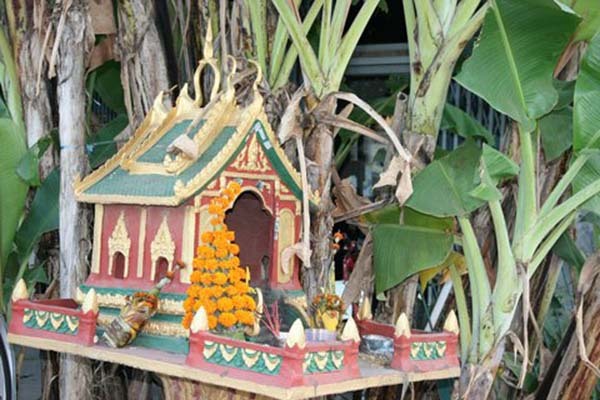 Many wats have a small spirit hut built in one corner of the grounds that is associated with the phi khoun wat, the beneficent spirit of the monastery. The souls of the ancestors can see the family members and can protect their homes. The spirits who live in the house and are worshiped in separate places dedicated to deceased relatives can be found in many homes. The ancestral spirit is a certain part of the buffalo, so skulls are a common feature of that change, and so some households sacrifice buffalo in a ceremony to honor the soul. Spiritual Practitioners also play a central role in ethnic groups as we have mentioned above in Lao Theung and Lao Sung ethnic group. They are like the communicator for both sides: living people and spirit. The Baci Ceremony or Soukhwan is the ritual that takes place to call all 32 parts of the soul back together by tying white cotton cord into the guest’s honor wrist. A center built with banana leaves and flowers. Ordinary Baci celebrations are celebrated for infant rituals, weddings or when someone travels or recovers after the illness. While Lao people do not believe that spirits are necessarily good or evil, they believe they are mischievous and must be calmed down or they may cause trouble. Most of the houses, businesses, and temples have a small house for spirits. Homes can be simply designed and made of wood or construction and covered in mosaics. Every soul house has a porch. The offerings include water, rice, candles, flowers, and incense. Lao people think that if the soul is nourished well, it will not cause trouble. Phi is the general term for Lao language or spirit. Some souls manifest as elements of earth, wind, water, and fire. Others live in mountains, rivers, fields and on land. One of the important things is to consult with the land spirits before building a new home. One of the taboos at night, do not be whistled because this is easy to attract the devil.